I was born on November 1, 1961 in Santa Monica, CA. My earliest memory is looking up from my stroller and seeing palm trees swaying over Santa Monica Boulevard (you’d think it would swilling wine from my baby bottle, but no such luck). When I was four years old, my family moved to the San Fernando Valley. I grew up in a ranch-style house in a residential neighborhood, where the lots were all at least an acre, so most of our neighbors utilized their backyards for swimming pools, tennis courts, big gardens and/or livestock. We had horses. 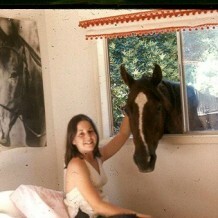 My mom was an avid horsewoman, so I pretty much grew up on the back of a horse. My younger sister Sheri did too, but she was never really into it. One time, we were riding double on a horse and she puked all over my back. She pretty much gave up riding after that. Sheri is the girly-girl of the family – she used to play with dolls. And tattle on me a lot. I was a tomboy – I played with Legos, Tinkertoys and model horses (it always pissed me off that Barbies couldn’t properly sit on a model horse – their legs didn’t spread correctly. Well, to be fair, Ken’s legs didn’t spread correctly, either). I have always had a fascination with animals, so along with the family’s horses, dogs and cats, I had aquariums full of fish and smelly cages of hamsters and mice in my room. I even had a pet crawfish for a while. I wanted to be a veterinarian. Our neighborhood was full of kids and it was actually pretty fun growing up in the San Fernando Valley in the late 1960s and 1970s. Our summers were all about riding skateboards, bicycles and roller skating (and horses for me) in the streets with the other kids and spending lots of time at the beach. We lived about 20 minutes from Malibu, so we spent lots of time there. My first introduction to wine (if you could call it that) was at sipping Mogen David at family Passover Seders as a little kid. I find it kind of ironic that for all the prayers we said (we Jews have a prayer for just about everything), the only prayer I remember is the one for wine. Funny, huh? More wine sipping/drinking came later at the Colorado River. My family was big into camping and waterskiing and once or twice a year we would join a handful of other families for a week or so of big fun in the sun. I remember my mom drinking big tumblers of Carlo Rossi or Almaden white wine with her friends on those trips and us kids snagging sips of wine whenever we could. We were feral children on those trips. The grown-ups were partying and we took full advantage. My folks divorced when I was eight and my dad became a Porsche-driving bachelor. He took it upon himself to educate my sister and me about travel, fine dining, tasting wine and food – something that I am eternally grateful for. At my mom’s house, we had school, our neighborhood friends, horses, camping, fishing and the beach – at my dad’s house (every other weekend), we also went to the beach, shopped at the big malls and ate at nice restaurants. He also took us to Hawaii, Mexico and Europe. Sheri and I had the best of both worlds as we were growing up. More wenchy history to come…stay tuned!